After being sent off by students at a small pep rally at 1:20 p.m. in the south parking lot of RBHS, the boys’ soccer team traveled to Ozark, Mo. to compete in the state semifinals Tuesday, Nov. 6. Ozark got on the board with the first goal of the game in the 11th minute as the Bruins were down 1-0, but the Tigers’ reign did not last long. 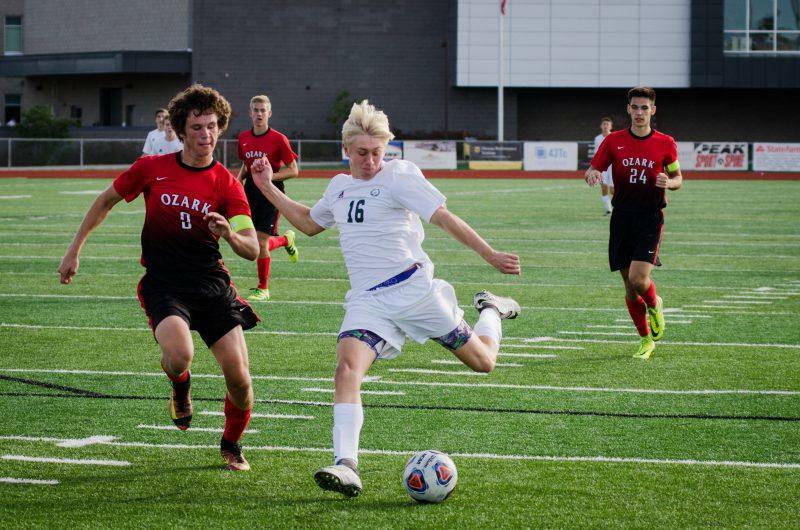 Sophomore Jeremiah Johnson leveled out the playing field with a goal, tying the game at 1-1. Less than one minute later, senior Jayton Johnson scored for the Bruins yet again, with an assist from Jeremiah Johnson. This goal gave the Bruins an edge that keeps them safe throughout the rest of the game with a 2-1 lead that they maintained for the duration of the game. Head coach Scott Wittenborn is very pleased with how the Bruins played. He is most excited, however, by how they responded to pressure. Senior Carson Linder would credit the win to the team’s depth and even after suffering the injury of standout forward Nate Durdle, he is confident in their abilities. The Bruins will face Lee’s Summit at home Saturday, Nov. 10 for the state quarterfinals and the final four will be on the line. The game will be at RBHS and the time of the game is being announced after the completion of the bracket. Wittenborn has complete confidence that his team will be able to compete with Lee’s Summit on Saturday. For him, it’s all about timing. Are you going to the state quarterfinals? Let us know in the comments below!